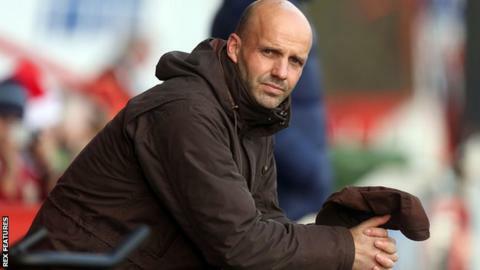 Exeter City must improve on their form in both penalty boxes, according to manager Paul Tisdale. The Grecians lost for the fourth successive League Two game as they went down 2-1 at home to Dagenham & Redbridge at St James Park. "I'm more than happy how we've played box to box, from one 18-yard line to the other," he told BBC Radio Devon. "We haven't converted our play into goals that matter, to defend the goal at one end and to score at the other." City remain in 16th place in League Two, nine points off the play-off spots and 13 off the relegation places. "The fact of the matter is I'm accountable for the results and that's four losses and that's not great - but the players are responsible for their jobs," he added. "We haven't taken our chances and we've leaked some soft goals, and if you're a defender you have to defend and if you're a forward player you've got to score or create a chance. "I can't defend them and say 'unlucky' - it's not unlucky. I don't know how many shots Dagenham had, but I can't remember any more than the two that they scored from. "I can't defend that, I have to be objective about it and today was a day when I wanted to be philosophical about it."